This intensive inpatient therapy program requires participation in physical, occupational, and speech therapy 3 hours per day 5-6 days per week. ARE YOU A NEW IN-PATIENT? Therapy sessions are provided in both one on one and group sessions using the latest technics to get you back in motion. The Sage team will provide you and your loved one with specialized training to assist with transitioning to your home environment. Sage Inpatient Rehabilitation Hospital is an 18 bed facility with both private and semi-private rooms. This skilled nursing & therapy program is a less intensive setting than inpatient rehab, specifically designed for individuals who are not able to tolerate 3 hours of therapy per day. Our skilled nursing program requires a need for skilled nursing 24 hours per day and participation in physical, occupational, speech, and/or respiratory therapy up to 2.5 hours per day 5-6 days per week. Your therapy will consist of one on one sessions between you and your therapist. Outside of your designated therapy sessions, our Activity Therapy Program provides daily organized activities you are sure to enjoy. Sage’s Skilled Nursing Facility is a 24 bed facility with both private and semi-private rooms. Nutrition is important for your health and healing. We strive to offer a variety of great tasting menu items that meet all of your nutritional requirements. Registered dietitians collaborate to plan menus according to the diet prescribed by your doctor. If you doctor changes your diet, we will automatically cancel your previous order and assist you with a new menu. If you have specific questions about your diet or need additional information, your doctor may refer you to a diet technician or registered dietitian. Note: If your family has brought in food for you, please check with the Nurse or Dietician to make sure it is appropriate for your diet. Guest trays are available for purchase at $4 each. Your treatment team is led by a Physiatrist (PM&R Physician, a doctor with specialized training in physical medicine and rehabilitation) and consist of nurses, physical therapists, occupational therapists, speech therapists, respiratory therapists, dieticians, and case managers for a multidisciplinary approach to your recovery. The Physiatrist leads the team in providing treatment and monitoring progress during your recovery. Other physician specialists such as a Pulmonologist, Internal Medicine, Infectious Disease, Vascular Consultants, and/or a Podiatrist may be called upon to participate in your treatment if needed. Patients are seen by both a Physiatrist and Internal Medicine/Family Practice physician, seven days a week in both skilled and rehab, which is unique and not common in other rehab or skilled settings. Physical Therapists improve mobility and functional independence by working to increase strength, flexibility, balance, and endurance. Mobility tasks addressed by physical therapy range from walking to wheelchair mobility as well as other tasks necessary to return to daily life. Physical Therapists can also make recommendations on equipment and assess modifications that may be required in the home in preparation for discharge. Occupational Therapists work on improving personal care and activities of daily living including dressing, grooming, bathing, eating, etc. and on more advanced self-care activities such as cooking, cleaning, gardening, home and money management. They also work to improve the use of arms and hands, including gross and fine motor control. Speech/Language Pathologists work towards improving cognitive and communication skills, including reading, comprehension, writing, memory, reasoning and problem solving. Certified in the latest technology, Sage SLPs also assess and treat voice and swallowing disorders (Dysphagia) through use of AmpCare® and VitalStim® Therapy. Registered/Licensed Practical Nurses and Technicians are available for patient care 24 hours per day, 7 days per week. With specialized training in rehabilitation, they possess the skills necessary to care for patients with decreased function and mobility. Registered Dietitians consult with the medical staff and work with our patients to develop a diet and menu plan that supports their nutritional needs. The Dietician may also provide education on nutritional needs and/or dietary restrictions. Case Managers act as the liaison between the patient, patient’s family, physicians and insurance provider. They facilitate communication with our patients and their families to keep them apprised of their loved ones progress. The Case Manager works closely with our patients and families to provide necessary resources to help make informed decisions regarding discharge plans for care following their rehab or skilled care. 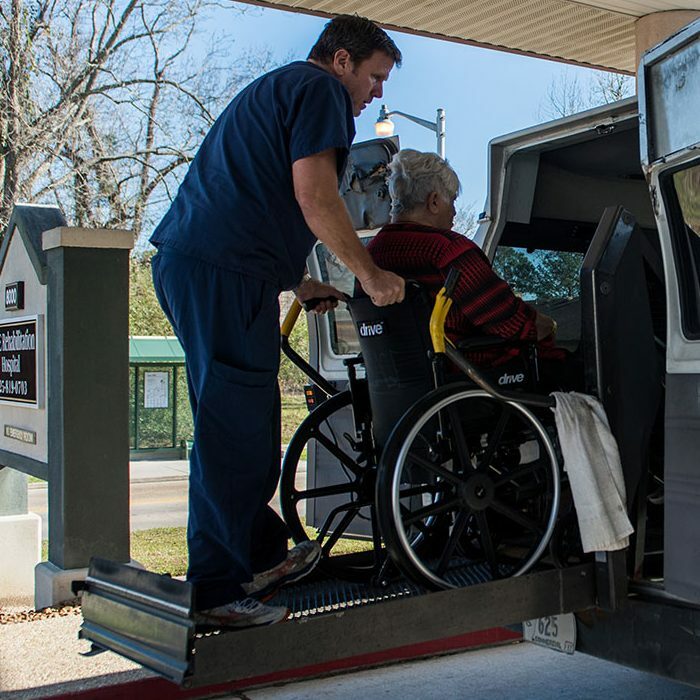 They also assist with setting up necessary services for a successful discharge to home health services, outpatient therapy or alternative living arrangements such as independent or assisted living or skilled nursing facilities. Social Workers (SW) – Helps patients deal with social, financial, emotional, vocational, and other practical aspects of their condition. SW’s help patients use the most effective coping strategies and problem solving to maximize their adjustment and recovery. SW’s counsel patients and family on issues including grief & loss, adjustment to altered lifestyle, caregiver concerns, and depression, anxiety and caregiver stress. Neuropsychologists are experts in the functions of the brain as they relate to the psychological and behavior processes. The neuropsychologist can offer standardized cognitive testing, driving evaluations, and/or medication reviews to determine the appropriate course of treatment for those with cognitive deficit. Sage Rehabilitation Hospital’s speech-language pathologists provide an evidenced-based treatment approach in the areas swallowing, language (receptive and expressive), voice, articulation, social and cognitive communication services designed to meet each individual patient’s needs. AmpCare– AmpCare is a safe and effective treatment for patients suffering with difficulty swallowing or dysphagia. AmpCare is a non-invasive, external neuromuscular electrical stimulation therapy utilized improve overall swallow function and to strengthen the musculature involved with chewing and swallowing. 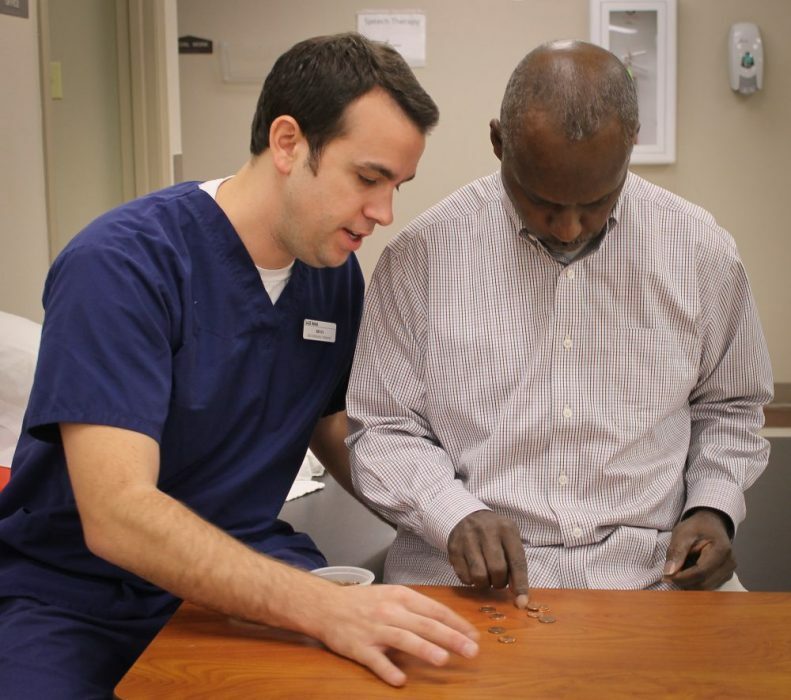 Traditional Swallowing Therapy– Compensatory strategy training, swallowing exercises, diet modification, suctioning/oral care, and positioning recommendation are provided by Sage SLPs. Cognitive Retraining– Sage SLPs design patient-specific remediative and compensatory cognitive training to assist patients to improve safety in the home, to improve function with daily activities, and to address memory and executive function deficits that affect mobility and basic care needs of the patient. LSVT (LOUD) Trained Therapists– The Lee Silverman Voice Treatment (LSVT) is utilized by SLPs to treat vocal deficits as a result of Parkinson’s Disease. LSVT LOUD treatment tasks are directed toward increasing overall volume and endurance of the patient’s voice and to improve breath support over consecutive sessions. SLPs utilize specific cueing techniques to assist the patient to achieve the highest level of vocal performance. Sage Rehabilitation Hospital’s physical therapists provide an evidence-based treatment approach in the recovery of orthopedic, neurologic, and cardiovascular impairments. Treatment sessions are individualized for each patient and might include activities for strengthening, balance, flexibility and endurance as well as functional training to improve bed mobility, walking ability, and/or wheelchair mobility. NDT treatment approach. Neuro –Developmental Treatment (NDT) is a hands-on approach used by Sage therapists to improve function after neurological injuries, such as strokes or other forms of brain injury. The NDT approach uses tasks meaningful and functional to the patient to develop new nerve pathways, allowing patients to regain function lost from the neurologic injury. Therapists work with patients, loved ones, caregivers, physicians, and other members of the rehab team to develop an individualized treatment focused on recovery of tasks meaningful to the patient. Use of manual therapy. Manual therapy includes various hands-on techniques used to increase flexibility and reduce pain. These techniques include but are no limited to massage therapy, range of motion exercises, and joint mobilization. Once flexibility and pain are addressed with manual therapy, functional mobility improves at a faster rate. LSVT BIG trained physical therapist. Lee Silverman Voice Treatment (LSVT) began as a highly effective speech therapy approach specifically designed to treat Parkinson’s Disease. The LSVT principles have been applied to the whole body and developed into a physical therapy and occupational therapy treatment (LSVT BIG). LSVT BIG targets impairments specific to Parkinson’s Disease and uses specialized cues effective in patients with Parkinson’s Disease. Both LSVT BIG (physical/ occupational therapy) and LSVT LOUD (speech therapy) have a multitude of research supporting the use of these treatments. 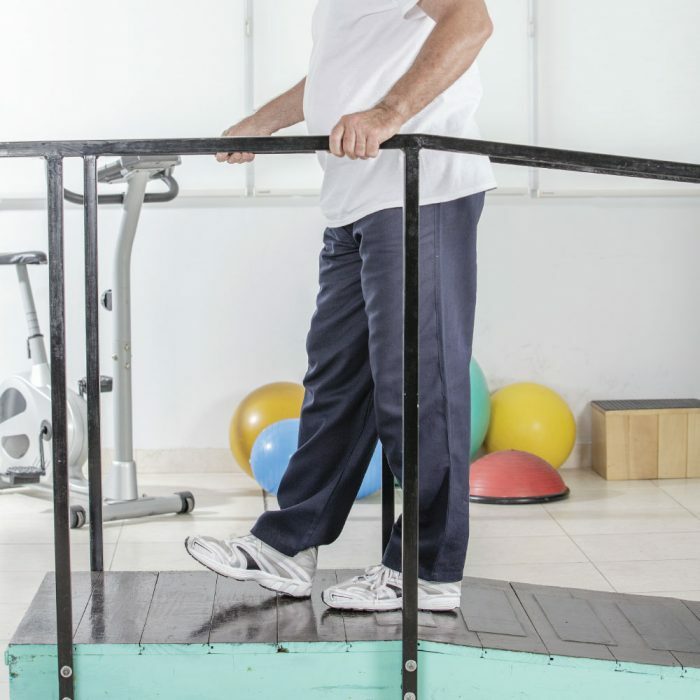 Lite Gait is designed to support a percentage of the patient’s body weight in standing. This allows therapists to progress patients from non-weight bearing to full weight bearing in a fall free environment as patients practice walking. NuStep provides a total body workout using a smooth stepping motion. It supports deconditioned patients and provides a low impact exercise with minimal joint stress. Adjustable resistance levels allows therapists to increase the challenge as the patient progresses. Occupational therapists work to help patients develop, recover, or improve the skills needed for activities of daily living after they have had an injury or illness. Treatment sessions might include teaching a patient to re-learn how to dress or feed themselves or to prepare a meal using a new approach or technique. A patient may need to strengthen their upper body or learn to use their hands in order to be able to return to work or home. Simulated functional activities can help retrain weakened muscles when a skilled therapist designs and directs an appropriate treatment program that is individualized to meet the needs and goals of each patient. Lymphedema Management. A certified lymphedema therapist can help address uncontrolled swelling through a combination of manual lymphatic techniques (massage) and compression bandaging that will improve circulation of fluids, improve skin conditions, and decrease discomfort. Animal Facilitated Therapy. Canine Companions for Independence has provided Sage Rehabilitation with a professionally trained facility dog to use during therapy sessions to help patients achieve their goals. “Leena” has received two years of extensive and specialized training and has passed the nationally standardized public access test in order to allow her to safely work with patients in the hospital as well as while on community outings. Her facilitator has been trained to utilize the approximately 40 commands that Leena is able to perform, and incorporate them into a therapy session which can address strength and balance issues, cognitive deficits, and provide external motivation for patients that may otherwise resist certain treatments.